Compression feel for securing your feet. No Rollover. Control is 10x easier without laces to get in the way. NSG grip makes you unstoppable in all conditions. Don't be fooled by it's apparent sock-like look and feel. This cleat just like any other cleat needs to be broken in. 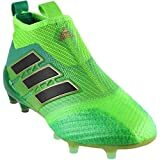 Lack of responsive aspect since it's laceless. Medial and Lateral lining is very stiff. 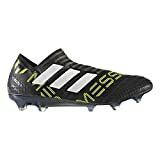 If you're in the market for an elite-soccer cleat this you may not find any better than the Adidas ace 17+ Pure Control. This cleat offers just about everything we marvel over in modern day football. Sleek futuristic design, most up to date technology applied to enhance your game and of course it's laceless! There's no doubt that you'll enjoy this cleat. The Adidas Ace 17 pure control is a cleat fit for your modern day footballer. Laceless cleats are becoming the standard for what makes a great soccer cleat. 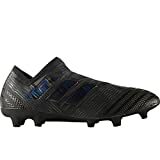 This is confirmed as well by notable professional footballers who choose this cleat. How you transcended from fan to true player? The Ace 17+ pure control may be testament to your commitment on the field. The Ace 17 pure controls have been regarded as an extremely comfortable soccer cleat. It’s worth noting that although it looks like it fits on like a sock that’s hardly the case. If the cleat slipped on as easy as a sock then it would slip off just as easily. That’s why when you order a pair of these you get a shoe horn that will help you get your foot in. You should just about need the shoe horn every time you’re putting them on. Attempting to put the shoe on without the shoe horn could cause irreversible damage. Usually this damage comes int he form of a lump in your heal that won’t go away. So take warning that if you’re going to wear an expensive pair of soccer cleats treat them like they’re your ticket to a professional contract. Laces being responsible for a poor touch or bad shot is now a thing of the past. At the end of the day it’s about being able to perform to the best of your ability day in and day out. This cleat is perfect for any player playing at or trying to take his game to the highest level. The adidas ace 17 pure control has a synthetic primeknit upper that wraps covers the foot with an adaptive like support for a confident and comfortable feel. The knitted material is covered in an very thin filmy layer that serves to prevent water, dust and other unwanted junk (debris) out of your knitting. Grandma will be happy to know you stuck with your traditional methods to get the job done on the pitch! The Adidas PURECUT is not necessarily a relatively new concept. The idea here is that the compression you’ll feel (and you will feel it) will help enhance the overall stability of the cleat. This means a welcoming snug fit that allows you to really feel the ball with a type of control unmatched by any cleat in the industry. If you’re looking for a cleat that promotes ball control then you can’t get much better than this cleat right here. The NON-STOP GRIP (NSG) offers aid in controlling the ball in all conditions. There is a thin layer of raised dots wrapping around the the upper. This is should make controlling the ball in poor weather a breeze. A crisp first-touch is essential to your success as a player. The Outsole is a feathery-lite one. The SPRINGFRAME outsole is strategically designed to provide a reasurring stability that will cover you at the highest speeds. The conical studs are there speaking to any midfielder bold enough to hear it’s call. Cut, turn and pivot as you’d like. The compression (as mentioned earlier) will give you a faster reaction time that will surely enhance your stop and go movements. The Adidas Ace 17+ Pure Control was designed for players who like to move at high speeds. This cleat is best suited for a player looking for a cleat that will provide control and stability. The TOTAL Control stud alignment works best on firm-ground and some forms of artificial grass. Every player wearing a pair of these cleats has a duty to give their all on the field at all times.